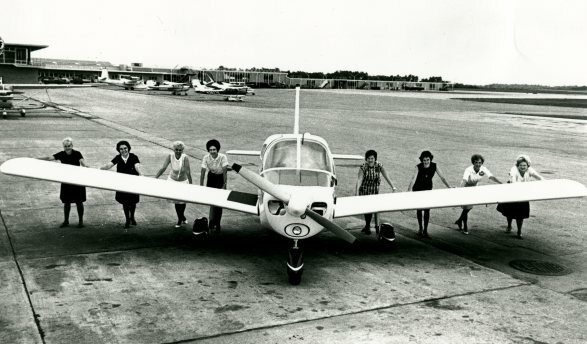 "Women with Wings: the Tennessee Ninety-Nines"
Our graduate assistant, Kelsey Lamkin, curated a new online exhibit on The Ninety-Nines, an international organization for women pilots. Arranged topically, the exhibit highlights events from the Tennessee chapter’s founding in 1940 through their activities into the 1970s. Much of the exhibit’s content comes from The 99s Collection, which is part of the Tennessee Aviation Hall of Fame Records housed at the Albert Gore Research Center. Jim Free served as an administrative assistant to Ned McWherter when McWherter was speaker of the Tennessee House of Representatives. In 1977, Free was hired as Special Assistant for Congressional Affairs to President Jimmy Carter, advocating Carter’s positions on transportation, trade and environmental issues. Beginning in 1981, Free spent the next three decades representing major global companies in areas such as energy, entertainment, communications, health care, financial services and transportation for two consulting firms. During his visit, he spoke with MTSU undergraduate and graduate students about politics, business, and the music industry. As the Tennessee Historical Commission continues its negotiaions on changing the name of Forrest Hall, the Gore Center invites the public to explore our digital collection documenting the history of Confederate symbolism on MTSU's campus. The collection currently contains over 430 entries. From February 27-28, the Albert Gore Research Center welcomes two former Members of Congress to MTSU's campus. Ron Sarasin, who represented Connecticut’s District 5 from 1973-1979, and Glenn Nye, who represented Virginia’s District 2 from 2009-2011, join Dr. Louis Kyriakoudes and Kent Syler on various classroom visits to discuss current and past political issues with undergraduate and graduate students. Congress to Campus is a program developed by the U.S. Association of Former Members of Congress. From the President to the People exhibit now open! Our new exhibit on the Inauguration From the President to the People is now open during our usual business hours. The exhibit explores the history of the political process and logistics of planning inaugural events. The exhibit features documents, photographs, and objects from the Albert Gore Papers, Bart Gordon Papers, John McFarland Papers, MTSU University Archives, and Tennessee State University Special Collections. There is also a select number of items in a separate case from President Trump's Inauguration. Gore Center staff took part in Veterans Day activities at Stones River National Battlefield on November 12, 2016. The Gore Center set up a booth with a listening station for our Veterans Voices: Stories of Service podcast, and staff members met with veterans to make appointments for future oral history sessions. On October 20, 2016, Dr. Kyriakoudes and graduate assistant Julie Maresco drove to Tusculum College in Greeneville, TN to install the exhibit at its first location in the President Andrew Johnson Museum & Library.